1. Surfside Shores condos for sale in Gulf Shores AL. Nicely decorated gulf-front resisdence with a gulf-front master suite. Private balcony overlooking the pools and white-sand beach. 2 pools and one is heated! Complex is conveniently located near the heart of Gulf Shores; restaurants, shopping, festivals and more! This is a must see unit! 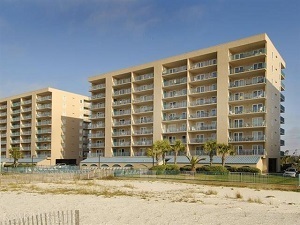 Surfside Shores condos in Gulf Shores overlook the white-sand beaches that make the area a popular tourist destination. These resort communities are situated on West Beach and have two & three-bedroom beachfront residences overlooking the white-sand beaches on Alabama’s Gulf Coast. The property amenities feature a BBQ area, multiple pools and more. The complex has a good rental history, with visitors returning year-after-year.